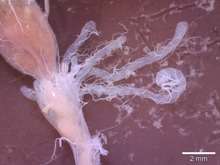 The cecum or caecum (/ˈsiːkəm/, plural ceca /ˈsiːkə/; from the Latin caecus meaning blind) is an intraperitoneal pouch that is considered to be the beginning of the large intestine. 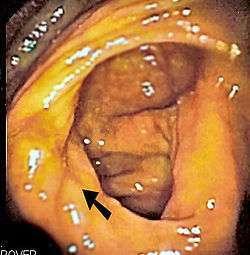 It receives chyme from the ileum, and connects to the ascending colon of the large intestine. 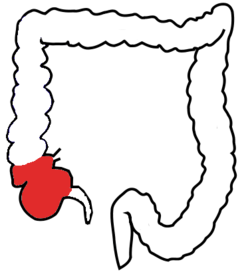 It is separated from the ileum by the ileocecal valve (ICV) or Bauhin's valve. 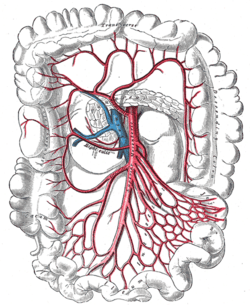 It is also separated from the colon by the cecocolic junction. 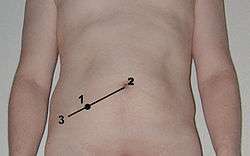 The appendix is connected to the cecum. 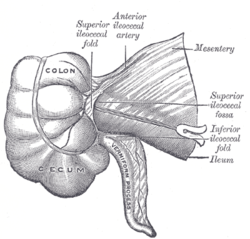 While the cecum is usually intraperitoneal, the ascending colon is retroperitoneal. 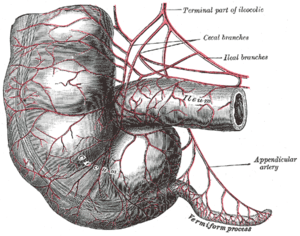 The term cecum comes from the Latin caecum, literally "blind", here in the sense "blind gut" or "cul de sac". 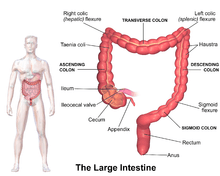 ↑ "The Large Intestine". VideoHelp.com. ↑ Taylor, Tim. "Anatomy and Physiology Instructor". 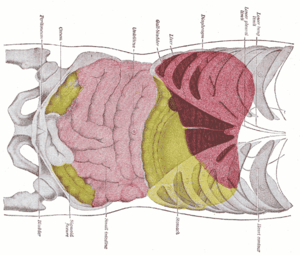 InnerBody.com. Howtomedia, Inc. Retrieved 28 November 2014. 1 2 3 Romer, Alfred Sherwood; Parsons, Thomas S. (1977). 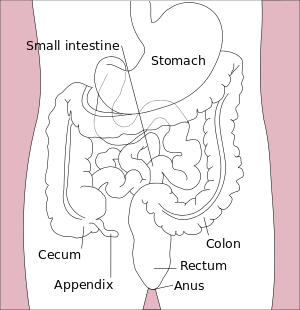 The Vertebrate Body. Philadelphia, PA: Holt-Saunders International. pp. 353–54. ISBN 0-03-910284-X. ↑ Clench, Mary H.; Mathias, John R. (1995). 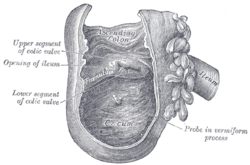 The Avian Cecum: A Review. Ann Arbor, MI: Wilson Bulletin. pp. 93–121, vol. 107(1) March. 1 2 Guarner F, Malagelada JR (February 2003). "Gut flora in health and disease". Lancet. 361 (9356): 512–19. doi:10.1016/S0140-6736(03)12489-0. PMID 12583961. ↑ Beaugerie L, Petit JC (April 2004). "Microbial-gut interactions in health and disease. Antibiotic-associated diarrhoea". Best Pract Res Clin Gastroenterol. 18 (2): 337–52. doi:10.1016/j.bpg.2003.10.002. PMID 15123074. ↑ Vedantam G, Hecht DW (October 2003). "Antibiotics and anaerobes of gut origin". Curr. Opin. Microbiol. 6 (5): 457–61. doi:10.1016/j.mib.2003.09.006. PMID 14572537. ↑ Williams, L. W. (1910). The anatomy of the common squid : Loligo pealii, Lesueur. American Museum Of Natural History.